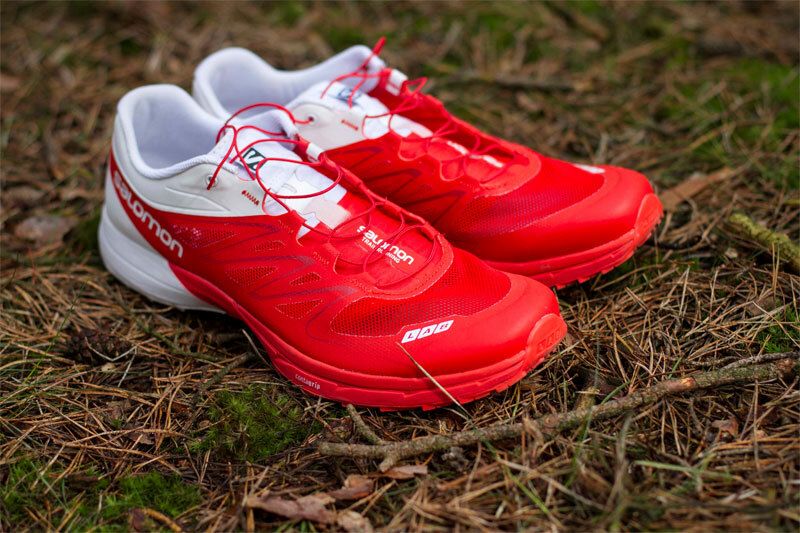 The Salomon S-LAB Sense Ultra is iconic. 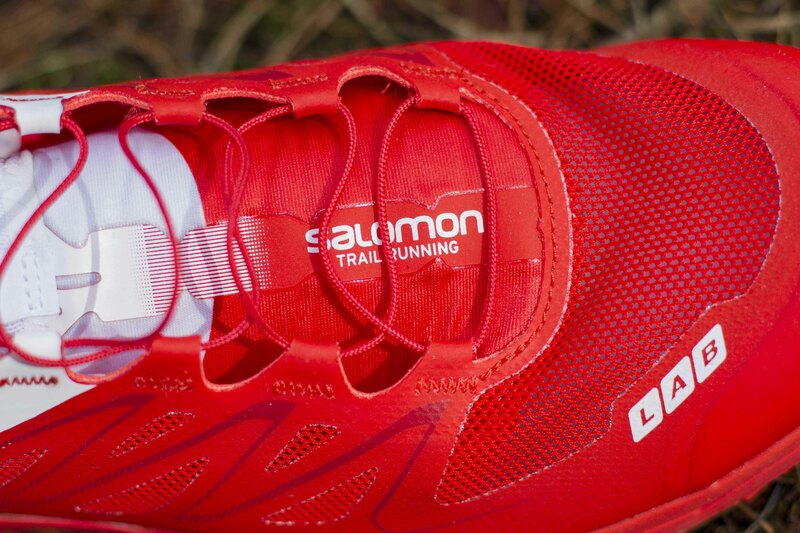 For anyone who has an interest in Salomon’s trail running team, they will be aware of the famous red and white flash of their S-Lab Sense Ultra range. Developed and worn by the likes of Kilian Jornet, Emelie Forsberg and Tom Owens, they are the most race-oriented performance offering from the bands comprehensive arsenal. 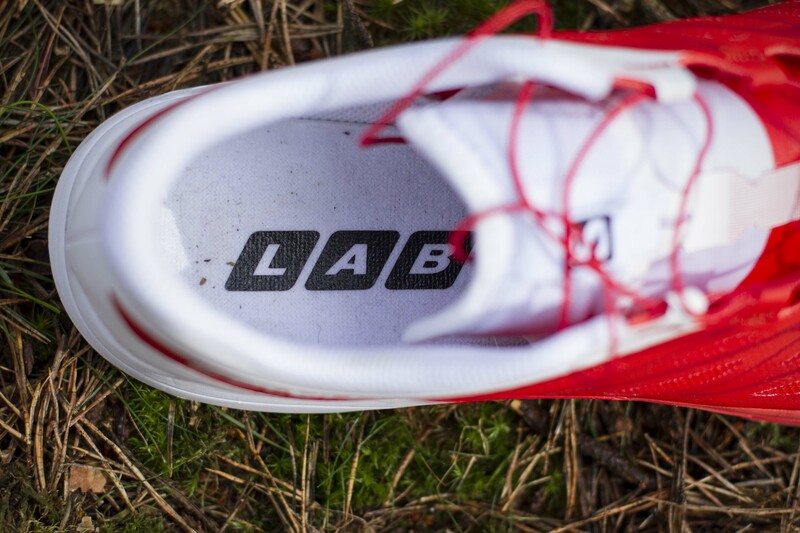 The S-LAB division of Salomon is constantly being tested and evolved by their team of elite runners as seen earlier this year at International Week. With prototypes often seen on the international race circuit, each series of products is a step above the previous, fine tuned and ready to take on the mountains, trails and global adventures. Personally, I’ve wanted to try a pair for a long time, given the amount I have seen them in races, films and marketing. When I was offered the opportunity I said yes without hesitating and it wasn’t long before the pinnacle of Salomon’s family tree was in my possession. First and foremost, the Sense 5 Ultra is light. At 245g each for a UK 10 (independently tested), they feel much less given their low profile. Once on, they are one of the lightest shoes I have ever worn and the combination of Endofit™ and Sensfit™ wraps the upper round every contour. But we will get into the specifics in a bit. 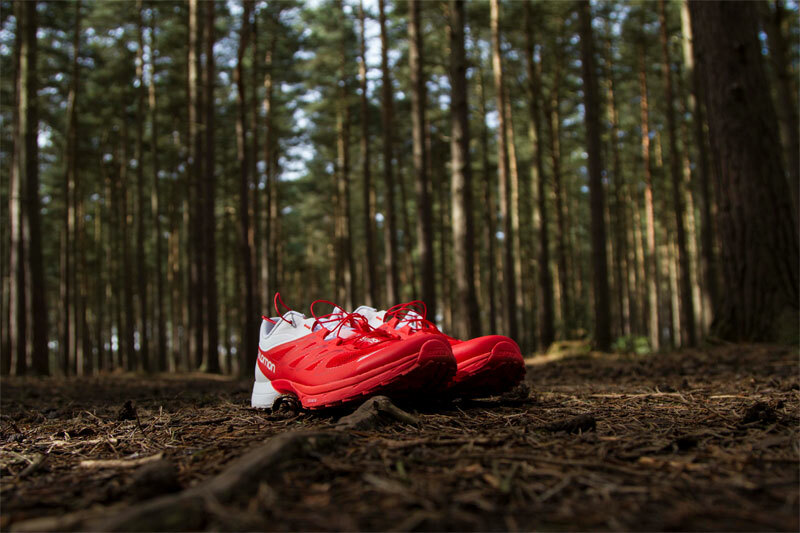 The Sense 5 Ultra is aimed for hard packed and dry trails, with the Soft Ground or SG version built for muddy aggressive trails. Even so, look at where athletes compete with the hard pack version and you could be forgiven for writing off everything I have just said. 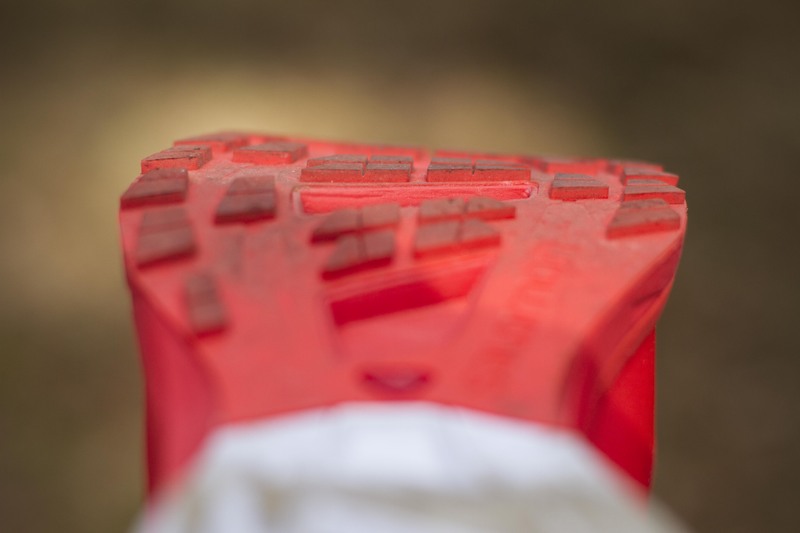 The outsole is constructed from a blend of High and Wet Traction Contagrip®,Salomon’s chosen rubber blend. With low profile lugs, they excel in biting into sand and harder packed trails, without becoming a hindrance or anchor. On top of this, I took them onto the road a couple of times for 6-8 mile runs, and neither time did it feel odd like some trail shoes do. Yes, the lack of cushion over a road specific shoe was noticeable, but it wasn’t uncomfortable. Wear on the outsole is good, the shots above were taken after a few miles, so not a true representation, but I have achieved my usual 50+ while testing and they show no premature signs of wearing down. Given the sole munching abrasives the will meet on drier trails, this is a positive sign. The cushion is provided by a triple density compressed EVA which aims to deliver a balanced combination of cushion, stability and control. The cushion provides protection and comfort, but don’t be confusing this with a plush deep cushion. It protects from the trail, in unison with the ProFeel rock protection and aids keeping your feet fresh over longer miles. However, what it provides unlike many others, is a true feel of the terrain beneath. Think of it like comparing a family estate to a Ferrari, you’ll feel the road through the steering wheel with the latter and this is very true of the Sense 5 Ultra. Rather than a numb or watered down sensation, you know exactly where your foot sits with every step you take. It’s reassuring and encourages you to push on, knowing you can feel your way round sharp descending twisting trails. Now for most runners comes the important number. The drop. 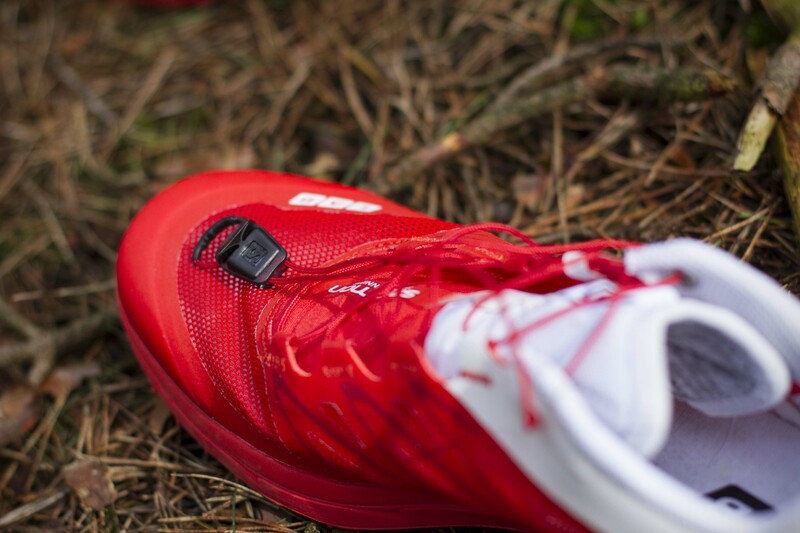 The Sense 5 Ultra has a 4mm drop, with 18mm at the rear and 14mm in the toe. 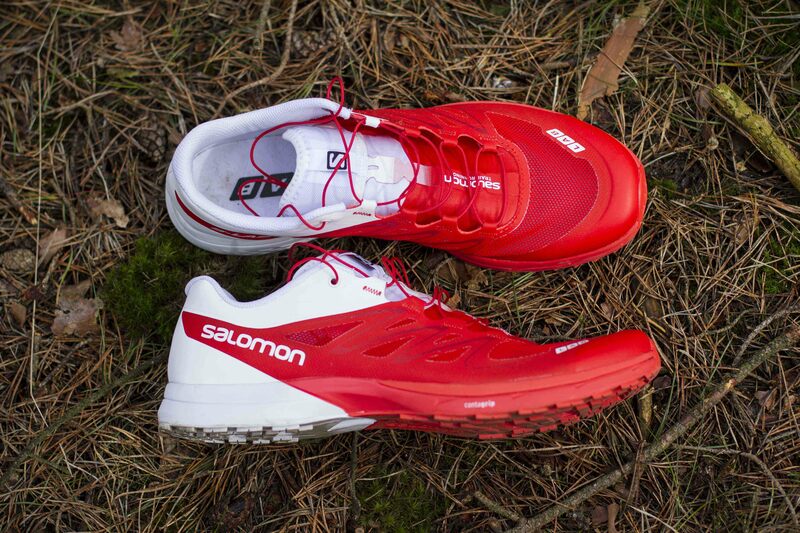 In the course of testing shoes I often switch between 4-8mm, with 4mm’s mainly used for fast runs on trails and roads. It does require a stronger foot and efficient gate. Currently, I sway more the higher drop in the range, however, I am getting more used to 4mm. So for now, 4 for fast and 6+ for longer runs. 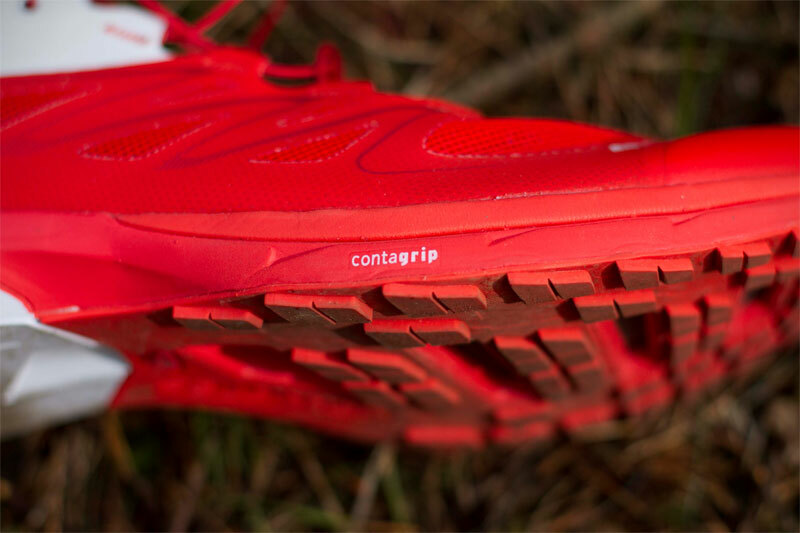 If you want to take the Sense 5 Ultra onto the trails and use higher drops currently, build them into your shoe rotation and slowly build up the mileage. Allow your foot and muscles to adapt, that way you’ll enjoy them fully. And to the upper. It is unlike any I have used before….. I can see my toes through it! The mesh used on the toe box is light, flexible and the weave is far broader than other models. Run through sand and may get a little in your toes if running sockless. Head out on a cold weather run, you will feel breathability that is unrivalled. 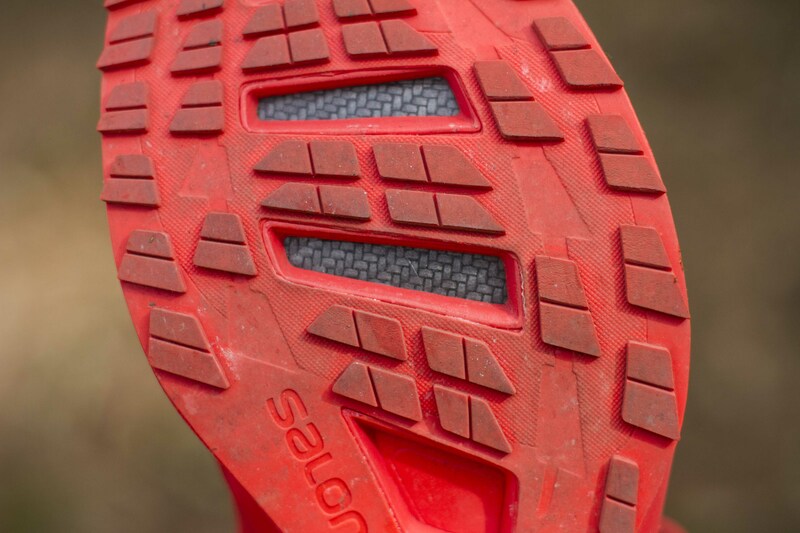 It breathes well and is very abrasion resistant; you wont find tears when misjudging technical foot steps like some soft multi layer mesh uppers. It’s built for high miles. On the front of the toe, the rand is sizeable and offers substantial protection, without become restrictive. One thing Salomon have done over the past few years is pass the technology from the Sense Ultra range, down to the like of the Speedcross, Sense Pro and Sense Pro, with the Sense Ultra range offering a glimpse of what lies ahead in coming years. Sensifit™ cradles your foot and combined with the Endofit™ forming a sleeve, wearing the Sense 5 Ultra is as comfortable with or without a sock. 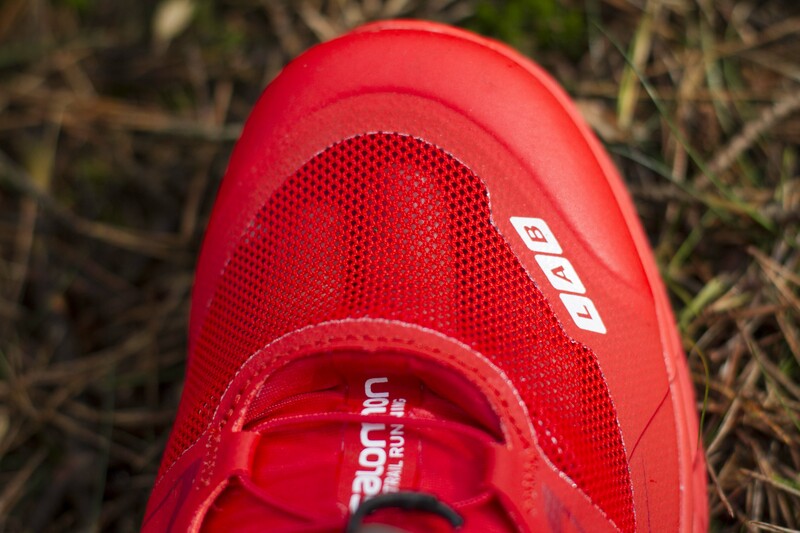 Even when on more technical terrain, the shoe stays true on the foot, without any large slipping or sliding. And this goes back to the fact is light, yet supportive. The design or internal architecture has created a shoe which is like wearing a sock, yet providing support, protection and grip. To be frank, its only when you start to peel back the layers and have a good examination that you can see the level of detail. For quick on the move changes, the Quicklace™ is reliable as ever and something which my brain still struggles to understand. I can spend a lot of time fine tuning laces, however, with Quicklace™, I grab, pull and tuck them away into the lace pocket. Simple, efficient, precise. The tongue is gusseted, helping keep debris out and it’s very thin, replicating a sock rather than a large flap of material. At the rear of the foot, the heel cup is supportive and prevents heel slip. Soft, yet not substantial, it supports the heel, without getting in the way. The Sense 5 Ultra is rapid, full of features yet not cumbersome. It’s expensive. At £145 I can see a lot of people recoiling and wincing. It’s a sizeable investment. What I can say is the build quality is unquestionable and the precision of technologies used go in some way to explain the SRP. For efficient runners, looking for a low profile, light rocket, the Sense 5 Ultra is a worthy weapon. It has stood aloof of podiums world wide in its many evolutions which is a testament to their design and heritage. Yes I hear you cry, this is down to the athletes wearing them, and I agree. But, without grip and comfort, it would make these achievements a whole lot harder. I like the Sense 5 Ultra. I took the Sense 5 Ultra around my local trails and North Wales. On all occasions, I enjoyed my runs and more importantly looked forward to the next. All I could point out is the tow box weave could be slightly closer and that is it. Now for the Soft Ground version.